The Glance Database API contains several methods for moving image metadata to and from persistent storage. You can find a list of public methods grouped by category below. context — corresponds to a glance.context.RequestContext object, which stores the information on how a user accesses the system, as well as additional request information. image_id — a string corresponding to the image identifier. memb_id — a string corresponding to the member identifier of the image. image_create(context, values) — creates a new image record with parameters listed in the values dictionary. Returns a dictionary representation of a newly created glance.db.sqlalchemy.models.Image object. image_update(context, image_id, values, purge_props=False, from_state=None) — updates the existing image with the identifier image_id with the values listed in the values dictionary. Returns a dictionary representation of the updated Image object. from_state — a string filter indicating that the updated image must be in the specified state. 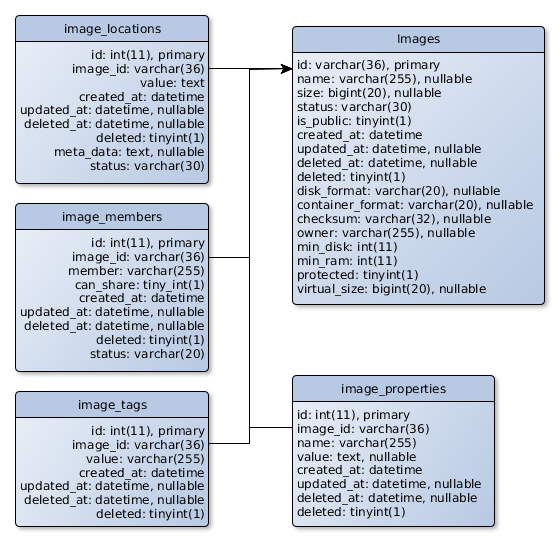 image_destroy(context, image_id) — deletes all database records of an image with the identifier image_id (like tags, properties, and members) and sets a ‘deleted’ status on all the image locations. image_get(context, image_id, force_show_deleted=False) — gets an image with the identifier image_id and returns its dictionary representation. The parameter force_show_deleted is a flag that indicates to show image info even if it was ‘deleted’, or its ‘pending_delete’ statuses. image_get_all(context, filters=None, marker=None, limit=None, sort_key=None, sort_dir=None, member_status='accepted', is_public=None, admin_as_user=False, return_tag=False) — gets all the images that match zero or more filters. filters — dictionary of filter keys and values. If a ‘properties’ key is present, it is treated as a dictionary of key/value filters in the attribute of the image properties. marker — image id after which a page should start. limit — maximum number of images to return. sort_key — list of image attributes by which results should be sorted. sort_dir — direction in which results should be sorted (asc, desc). member_status — only returns shared images that have this membership status. is_public — if true, returns only public images. If false, returns only private and shared images. admin_as_user — for backwards compatibility. If true, an admin sees the same set of images that would be seen by a regular user. return_tag — indicates whether an image entry in the result includes its relevant tag entries. This can improve upper-layer query performance and avoid using separate calls. image_location_add(context, image_id, location) — adds a new location to an image with the identifier image_id. This location contains values listed in the dictionary location. image_location_update(context, image_id, location) — updates an existing location with the identifier location[‘id’] for an image with the identifier image_id with values listed in the dictionary location. image_location_delete(context, image_id, location_id, status, delete_time=None) — sets a ‘deleted’ or ‘pending_delete’ status to an existing location record with the identifier location_id for an image with the identifier image_id. There is no public property update method. So if you want to modify it, you have to delete it first and then create a new one. image_property_create(context, values) — creates a property record with parameters listed in the values dictionary for an image with values[‘id’]. Returns a dictionary representation of a newly created ImageProperty object. image_property_delete(context, prop_ref, image_ref) — deletes an existing property record with a name prop_ref for an image with the identifier image_ref. image_member_create(context, values) — creates a member record with properties listed in the values dictionary for an image with values[‘id’]. Returns a dictionary representation of a newly created ImageMember object. image_member_update(context, memb_id, values) — updates an existing member record with properties listed in the values dictionary for an image with values[‘id’]. Returns a dictionary representation of an updated member record. image_member_delete(context, memb_id) — deletes an existing member record with memb_id. image_member_find(context, image_id=None, member=None, status=None) — returns all members for a given context with optional image identifier (image_id), member name (member), and member status (status) parameters. image_member_count(context, image_id) — returns a number of image members for an image with image_id. image_tag_set_all(context, image_id, tags) — changes all the existing tags for an image with image_id to the tags listed in the tags param. To remove all tags, a user just should provide an empty list. image_tag_create(context, image_id, value) — adds a value to tags for an image with image_id. Returns the value of a newly created tag. image_tag_delete(context, image_id, value) — removes a value from tags for an image with image_id. image_tag_get_all(context, image_id) — returns a list of tags for a specific image. The next two methods inform a user about his or her ability to modify and view an image. The image parameter here is a dictionary representation of an Image object. is_image_mutable(context, image) — informs a user about the possibility to modify an image with the given context. Returns True if the image is mutable in this context. is_image_visible(context, image, status=None) — informs about the possibility to see the image details with the given context and optionally with a status. Returns True if the image is visible in this context.